The U.S. Department of Agriculture was forced to send home tens of thousands of employees because of Tuesday’s government shutdown. As a result, the agriculture department and its nearly two dozen agencies are operating at limited capacity – or not at all. But even though important agencies such as the Farm Service Agency and the Risk Management Agency will be shut down almost entirely, agriculture officials said that Midwest farmers and producers won’t be affected that much. Gebhards and other officials said that the biggest impact from the shutdown will be further delays to a farm bill resolution, which expired at the end of September. Gebhards said that if the shutdown were to last an extended period, then contract payments from conservation reserve programs may be neglected. Likewise, crop insurance claims may go unfiled, leaving farmers and producers without compensation for failed crops. Other agriculture officials said the shutdown could affect agricultural markets, as important statistical information will go unreported. One of the agriculture agencies suffering the most is the Risk Management Agency, which administers the federal crop insurance programs used to compensate farmers when their crops fail. 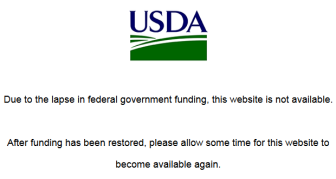 Because of the government shutdown, the U.S. Department of Agriculture temporarily disabled its website. Part of the message reads: "Due to the lapse in federal government funding, this website is not available." On the first day of the government shutdown, the Risk Management Agency closed entirely, dismissing its more than 430 employees. It said it will not conduct any job-related activities, and none of its employees will report to work. The agriculture department’s Farm Service Agency is basically closed, now operating at less than 1 percent of its full employment capacity. The Farm Service Agency is in charge of managing farm regulation and conservation laws throughout the country. 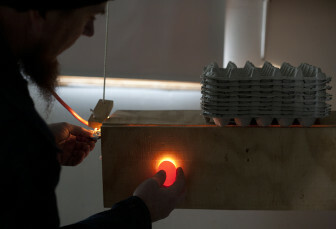 The agency normally employs more than 11,000 workers. During the shutdown, less than 100 of those workers – or those who are deemed “essential” – are allowed to report to work, according to the agency’s contingency plan. The agriculture department’s Rural Development program, which is supposed to ensure the well-being and socioeconomic livelihood of rural America, was also forced to start shutting down. It usually has about 5,000 employees working. On the first day of the shutdown, it was forced to send more than 4,000 of them home, according to its contingency plan. During the remainder of the shutdown, it will operate with only 53 total employees working. One of the Department of Agriculture agencies least affected by the shutdown was the Food Safety and Inspection Service, which is the regulatory body responsible for monitoring the nation’s commercial supply of meat, poultry and eggs. 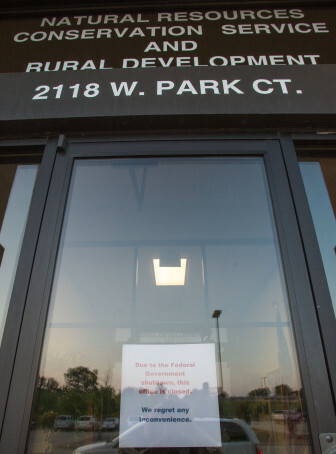 A sign explains the closed USDA offices in west Champaign, Ill., on Tuesday, Oct. 1, 2013. 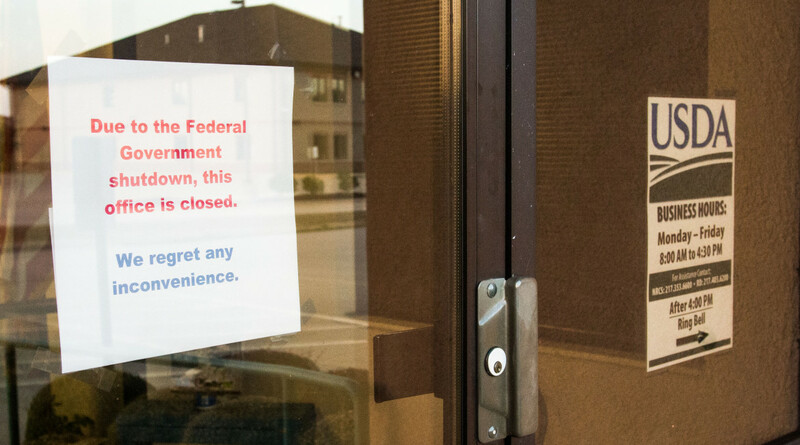 It reads: "Due to the Federal Government shutdown, this office is closed." It was only forced to send about 1,200 of its 9,600 employees home. During the shutdown, it will operate with a staff of about 8,400 employees, or about 87 percent of its regular staff. The Food Safety and Inspection Service did not shut down at a larger level because food and milk inspections are considered essential. The agency will still enforce all aspects of the Federal Meat Inspection Act, the Poultry Products Inspection Act and the Egg Products Inspection Act. For each day of the shutdown, inspectors will still conduct daily inspections at food production sites and will still monitor any product testing at laboratories. “These activities are excepted [from the shutdown] as necessary to protect health,” stated the agency’s contingency plan. - The Agricultural Marketing Service, which had to send about 400 employees home on the first day and will have to operate at about 84 percent capacity if the shutdown goes any longer than five days. - The Foreign Agriculture Service, which had to send about 600 employees home on the first day and will have to operate at about 40 percent capacity if the shutdown goes any longer than five days. - The Food, Nutrition, and Consumer Services agency, which had to send about 1,200 employees home on the first day and will have to operate at about 5 percent capacity if the shutdown goes any longer than five days. Meanwhile, the American Farm Bureau Federation, which is an independent farmers’ advocacy group, issued a statement about its worries regarding the shutdown and the failure to come up with a new Farm Bill.